Destination Italy "As the Romans Do" letters from Italy: Italian food, Italian eating habits, Roman cuisine, pictures of Italy,Italian culture, culinary tours & tours of Rome given by the author of the bestselling travel book on Italy; offers: travel planning services, Rome tours, italian sightseeing, & tourist information. The subject comes up almost every time we share a meal with Americans who have spent more than a few days sampling the culinary delights and charms of the Eternal City. One of the first things visitors notice is how good the food is -- its abundance, subtle flavors, freshness, consistency, and portion size. Immediately follows a second observation that one can't fail to notice after being in Rome only a few days: how good the people look, how one rarely sees a Roman who is seriously overweight, as one is prone to do in the United States. Before long the question comes up, "Given all this great food, why aren't these people fat?" On the surface Rome seems to be paradise: great food, no extra pounds. But the issue is a fairly complicated one, made up of many parts. In any culture, eating is more than a question of providing oneself with nutrition. It partakes of a specific way of life, reflecting the choices people make about what is most important to them. Ironically, Romans can eat as well as they do and still maintain their figures because food means more -- not less -- to them. The way you eat here matters, the choices you make about what to eat and when to eat it matter. Every meal is calculated, depending on the time of day, who one is with, the venue, the circumstances, and, of course, the level of one's appetite. To begin with, there are two factors working in favor of the romani keeping off extra weight. One is that, Romans move around more, are in motion more, the several times a day they visit their favorite coffee bar a block or two away, or the evening passaggiata. Since the city is so small, the spaces so tiny and crowded, taking a car everywhere is just impossible, so Romans, despite the entrenched habit of the motorini, and the unsatisfied desire to take their cars everywhere, are often on foot, carting groceries to living spaces on upper floors in palazzi without an elevator. There are no automatic garage door openers where you can almost put your car in the kitchen to unpack the bags, or shopping malls where what you need is all in one place. The second consideration is that there is basically no breakfast meal in Rome -- no bacon and eggs with toast and hashbrowns, no pancakes covered in maple syrup, slathered in butter, and dusted with powdered sugar, not even a bagel and cream cheese or a donut. Breakfast consists of a small, light sweet roll called a cornetto that weighs little more than a feather, together with a thimbleful of strong espresso or a cappuccino whose volume is much less than its American counterpart. This "meal" lasts until one o'clock in the afternoon, with another tiny coffee or two satisfying one's craving for caloric or gustatory intake. The afternoon meal -- pranzo -- is often the main meal of the day. This is when the tasty variety of foods is usually imbibed -- the antipasti of a plate of grilled vegetables, and maybe a taste of mozzarella or thinly sliced meats, followed by the carbohydrates of pasta or rice, a portion large enough to satisfy but not to overwhelm. At this point many foreigners quit, but often the romano goes further, adding the protein -- chicken, or fish, or perhaps meat, and the strong taste of bitter vegetable -- to the meal. Dessert is not often eaten, as Romans by and large do not have a big sweet tooth and therefore do not require a generous helping of something made with eggs, butter, cream, sugar, chocolate and/or custard to complete the meal. Pranzo is often topped off with another caffe, never a cappuccino, which has the odd effect of capping the flavors of the feast while it also suppresses the appetite until the next seating. Satisfied, content, full, the Roman does not usually sit down at the table again until at least eight or nine o'clock, except for an occasional small amount of gelato taken in full stride at 5 or 6 to tide one over if that is deemed necessary. The evening meal -- cena -- often consists of a thin crusted pizza or another light dish, and finished off with fruit and another coffee, which never seems to prevent the Italians from sleeping. The custom of desserts is so unusual that in old-line traditional trattorie, which cater exclusively to locals, the only sweet of the house consists of grapes or, in winter, oranges. There you have it -- rare eating between meals, no bags of Dorritos, no mini tacos, no side trips to McDonalds for a quick injection of french fries or a shake, just moderate portions of exquisitely prepared food, made with fresh ingredients and cooked with a centuries-old know-how that does not experiment much because by this time the recipes have been pretty much worked out. It's not nouvelle cuisine, but it is tasty, satisfying, and consistent, and if eaten calmly, untethered to the telephone, television, or office desk, it can be repeatedly enjoyed without adding what one would prefer to leave off. Tucked into the secret garden of the palazzo where Roman Holiday was filmed is a hideaway on Via Margutta, home to Federico Fellini and many artists. Your Roman cooking adventure will take place in this colorful setting. Let us help you learn the art of healthy, creative cooking all'italiano during a unique and personalized day in Rome. Under the expert tutelage of Jenny Nichols along with Diane Epstein, the discriminating visitor and your own private small group will discover fabulous Italian cuisine from shopping to final presentation. In picturesque, historic Rome you'll explore morning markets, shopping for delicacies and wine, learning how to choose the best ingredients. On Via Margutta you will assist in preparations and then sit back and enjoy your meal. Dining is not only about food, of course, and conversing with master chef Jenny and counselor/coach Diane will help you enrich the experience during this special day and the days to come. Begin your morning at a characteristic café As the Romans Do, indulging in a superb cappuccino and pastry while we discuss what's in season and plan the day's menu, tailor-made to suit your individual taste. With Diane and Jenny you will shop at the beautiful outdoor markets. At our favorite stalls you will meet the owners, some offering home-grown, organic fruits and vegetables, cheeses and genuino wine. Next, we visit fine delicatessens for the other ingredients. After the lively markets we retreat to the tranquility of Jenny's home on Via Margutta, where Audrey Hepburn was carried up the stairs in Roman Holiday. Your cooking lesson proper begins now -- and then comes the meal on the flower-laden terrace or lovely dining room. Depending upon the season, specialties from a broad range of Italian regions may include mint-scented artichokes, eggplant caponata, fried zucchini blossoms, fresh ricotta-filled ravioli, risotto with asparagus and peas, calamari salad with citrus dressing, marinated fish or seafood, chicken stuffed with faro and vegetables, luscious apricot or strawberry tarts and chestnut torte. The choice will be yours. Italian food is hearty and it can also be heart-friendly so let us know your special diet needs. For those in the shopping mood we can also drop by off-the-beaten-track specialty and cookware shops. And if you desire a photographic record of your culinary day in Rome for lasting memories, let us know. This is, after all, your Roman holiday. Your personal shopping and eventual photography costs are separate, but otherwise the all-inclusive price for the day includes the service of our private driver to and from the markets, the cooking lesson and full course meal. Jenny Nichols has been a master chef for thirty years. She has created gourmet meals in exquisite environments for private clients in the U.S., Italy and other European countries. She and her filmmaker husband have a daughter and have lived in Rome since 1998. Diane Epstein, M.A. health counselor and coach, leads workshops and retreats in Rome and the Italian countryside on creativity and the art of living and eating well. 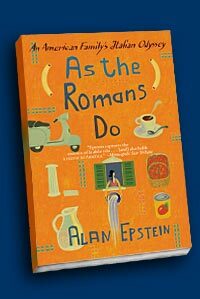 She is also a photographer and with her husband Alan Epstein, author of the bestselling book, As the Romans Do, has lived in Rome since 1995 with their two sons. Their family has been featured on the Oprah Winfrey show about "Choosing Your Life" in Italy, As the Romans Do. Are you or your friends, family or colleagues planning a trip to Rome? We would be delighted to receive your inquiries, travel itinerary and/or interest in Roman Holiday Culinary Adventures, As the Romans Do.